Plugging a local comic book show, Fan Expo, which is Canada's largest comic book/horror/sci-fi/anime/gaming event. As for a list of comic book guests, click here. 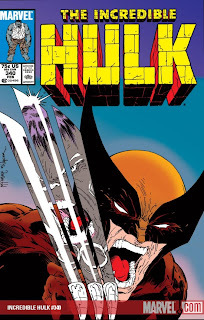 And probably the biggest 1980s draw will be Bill Sienkiewicz (New Mutants, Daredevil, Elektra); and for the 1970s, Len Wein (X-Men, Swamp Thing) and Richard Comely (Captain Canuck). If you're in the Toronto area or within a few hours drive, it's worth checking out. 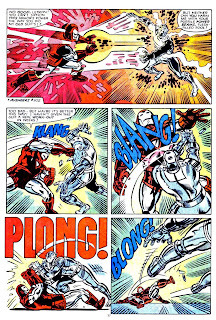 I can’t say that I was overly fond of Englehart’s first run on the Avengers (#105-150ish), but he was one of Marvel’s underrated writers in the 1980s penning the West Coast Avengers and Silver Surfer. And one of his best stoylines didn’t involve some of the more recognizable Avengers like Captain America, Thor, Wasp. 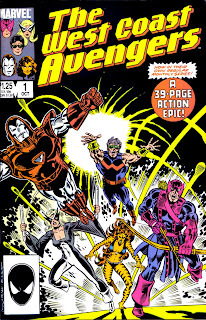 But rather the 2nd Avengers team, the West Coast Avengers. >The basic blot involved the Grim Reaper who wants the brother he knew (Simon Williams) back and he’s willing to destroy the Vision and Wonder Man to bring that about. He forms an alliance with Ultron who also wants the Vision destroyed. And for good measure, throw in a wildcard, one Dr. Henry Pym (Ultron’s creator). Steve Englehart did a great job with the story all around. On one side with the West Coast Avengers he juggles five very different characters and through some good characterization establishes the bonds between them. He also manages to insert a level of intimacy by recounting their individual origins. - The Vision’s ongoing struggle to be human as well as deal with the consequences of his recent actions in the Ultimate Vision where he tries to take over the world’s computers. - Wonder Man realizing who he was and how he’s become a better man as well as coping with his fear of dying. - Tigra’s inner struggle with her feline side and trying to contribute to a team in which she feels inadequate. - Pym, who has sworn off heroes, is dragged back into it because of his past actions. - And Hawkeye who is trying to bring his team together and establish it as a legitimate branch of the Avengers. The art in The West Coast Avengers is good, dynamic, and simple, but nothing more than that. 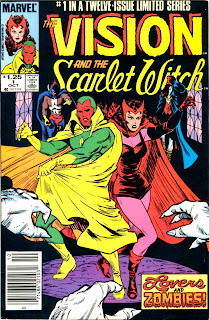 However, the art in The Vision and the Scarlet Witch is weaker and the action doesn’t flow as well as its counter part. It was nice to see a complicated crossover span only 4 issues (2 of which were 39-page special issues). It was a great start for both series, but unfortunately the Vision and the Scarlet Witch didn’t live up to for the length of their 12-issue run. The story ends as predictably as super-hero epic do, with good triumphing over evil since the evil doers couldn’t work together and were defeated by the good who did come together as a team. The Vision and Wonder Man force a climatic confrontation with their brother, the Grim Reaper. They force the Grim Reaper to abandon his prestige view of his brother Simon, but he sees the bond between Vision and Wonder Man as something he can never be a part of, and dies fleeing from this. And enjoyable read worth keeping an eye out for. He hails from an unimaginable era: the 31st century. 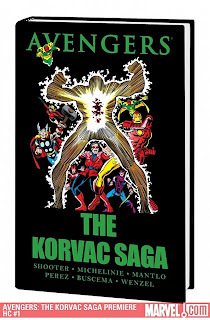 Fleeing through the timestream from the pursuing team of futuristic defenders known as the Guardians of the Galaxy, Korvac the Machine Man has established a secret presence on present-day Earth in the self-created persona of the mysterious Michael. Through such an unassuming guise, Korvac contemplates the elements of a universe he thirsts to command. Yet despite the subtlety of Michael’s machinations, the world’s greatest super-team -- the mighty Avengers -- catches wind of his cosmos-conquering scheme, thus drawing the two titanic forces into inevitable conflict. Collecting AVENGERS (1963) #167-168 & #170-177. 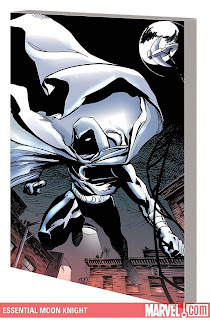 Night falls, the Moon Knight rises, and neither sorcery, science, nor mortal sin can win against him! Battles with Bushman and Morpheus, the Fly and the Raptor, plus hero vs. hero, the moon against the darkness, when the Fist of Khonshu battles the Hand of Darkness: The Shroud! Tales from not one, not two, but THREE monthly series, plus more! Guest-starring the Fantastic Four, the X-Men, Spider-Man, and Dr. Strange! Collecting MOON KNIGHT #31-38 & #1-6 (1985), MARVEL FANFARE #30 & #38-39, SOLO AVENGERS #3 and MARVEL SUPER-HEROES #1. One fun section is the countdown area (http://marvel.com/seventy_years/countdown) that spotlights the best stories and covers in Marvel Comics history as voted by the fans. The Marvel 1980s are well represented. 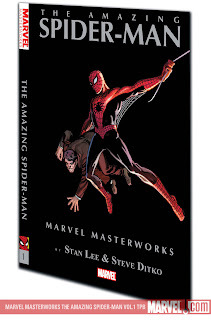 The Marvel Masterworks hold a special place in my heart. 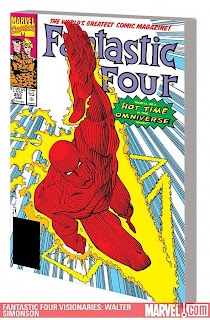 Back in the 1980s, reprints of the early Marvel Age were almost non existent. I fondly recall reading the first few volumes that my parents picked up for me at Christmas. Sure the artwork was rough and the dialog was awful and the narration was over the top, but it was the Silver Age at its finest and I loved every brightly coloured page. 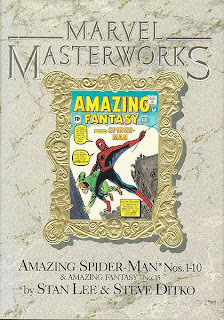 The Marvel Masterworks hit the stands in 1987 with its first volume, Amazing Spider-Man, reprinting Amazing Fantasty #15 and Amazing Spider-Man #1-10. 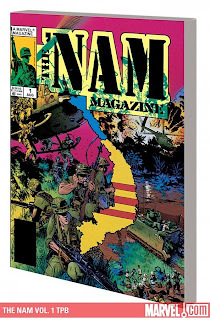 This hardcover collection featured a unique and distinctive marble dustjacket that is still available today as a variant edition. 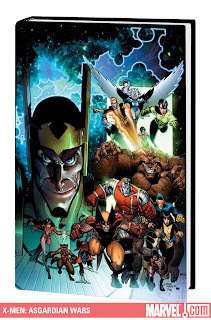 Volumes featuring the Avengers and X-Men and Incredible Hulk and Uncanny X-Men and Iron Man quickly followed. 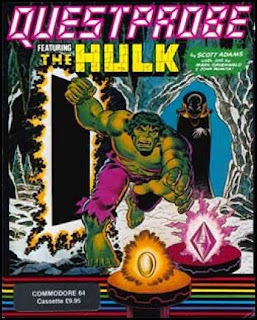 Each of these volumes generally reprinted 10 issues (in chronology) and for some like Captain America, Iron Man, and the Hulk included reprinting Tales of Suspense and Tales to Astonish. It was a wonderful way for a young comic book reader to catch up on back issues without having to pay a fortune for them. And as an adult now, it’s nice to have a full bookshelf of these beautiful hardcover reprints that are very close to reprinting the entire Marvel Silver Age. 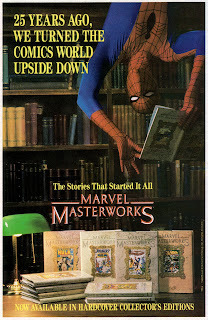 The first phase of the Marvel Masterworks ran from 1987-1994 and put out 27 volumes. 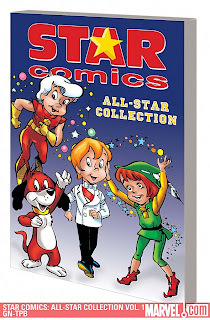 Between 1995 and 2004, a handful of volumes were produced, some with the ComicCraft dustjackets which was a break from the traditional marble dustjackets. Only a limited number of the marble dustjackets were produced making them rare and expensive collector’s items. In April 2004, new life was breathed into the Masterworks line and starting from volume #33, it has been regularly producing volumes on a monthly and sometimes twice a month (with the addition of Atlas Age Masterworks). Currently, the Masterworks are over 120 volumes and have reached well into the 1970s. It’s amazing the progress they’ve made in just over five years. I never imagined seeing hardcover reprints of Jim Starlin’s Warlock, or the Defenders, or Captain Marvel (Captain Mar-vell). Recently, a softcover version of the Masterworks line has been launched. 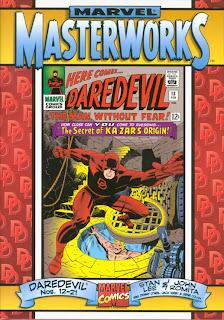 And with the success of the Masterworks, the Marvel Premiere editions reprinting a lot of 70s and 80s content have also been a success. From this two-page spread, we can infer a few things. -1- This little girl with the eye patch is Volstag's daughter Hildy and since she’s fighting alongside Fandrall and Hogun, you can’t help but conclude that something happened to Volstagg. Hence the “Saga of the Vengeance of Thor”. And what of the previous year’s hint at the death of an Asgardian. Not sure if this was resolved with the death of the Executioner. -2- “In the absence of Thor…” Where was Thor gone? I had planned on doing a god/giant war involving many of the characters I was playing with at the time but got off the title before that storyline ever came to fruition. 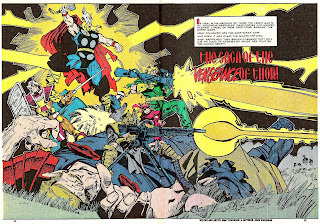 It's possible--but I don't remember now--that parts of the storyline of my final THOR plot were 'borrowed' from that original idea, although clearly, I didn't use Hildy (shown in the annual drawing) and I'd obviously had additional ideas about using mortal weapons in that storyline. Otherworldly wonder at the top of one world and the heart of another! In the Arctic Circle, the X-Men and Alpha Flight find a power that could save the world at the cost of destroying...what? But cost is no object when the power is revealed as a gift from Loki, who doesn't like it when his gifts are returned! 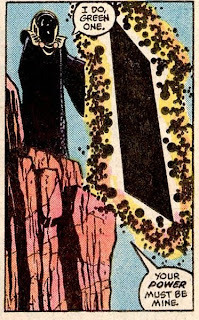 When the God of Lies loses his own prize, he decides one bad turn deserves another and sets his magic against the X-Men, only for the New Mutants to take the fall...and rise to Asgard! The X-Men ride to the rescue, but can even the mightiest mutants survive the multiple magics of myth? 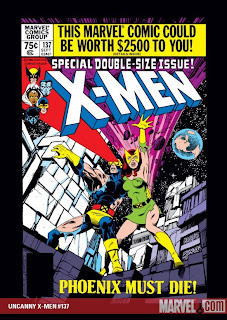 Collecting X-MEN AND ALPHA FLIGHT #1-2, NEW MUTANTS SPECIAL EDITION and X-MEN ANNUAL #9. 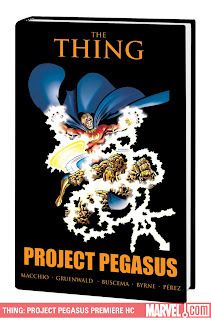 Project: PEGASUS hires the Ever-Lovin' Blue-Eyed One as a security chief, but what's the point if the place is already filled with super-villains in the first place? Featuring Hercules and Thundra, Deathlok and Dr. Strange, Captains America and Marvel, Man-Thing and...Classic Thing? Plus: action in Olympus and the Nexus, Hollywood and Yancy Street! New identities for THREE super heroes! All this AND Super Hero Poker Night! What a deal! Collecting MARVEL TWO-IN-ONE #42-43 & 53-58. It was the world's greatest comic magazine. Again. 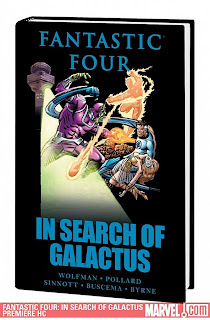 Not since the days of Stan Lee and Jack Kirby, the trailblazers of the very mythology known as the Marvel Universe, had someone so perfectly captured the intense mood, cosmic style and classic sense of adventure of Marvel's first family of heroes - the Fantastic Four. Writer. Penciler. Inker. Visionary. John Byrne took these characters, whose powers resulted from each of them being bathed in cosmic rays during a flight into space, and launched them into realms where few creators before this had dared to go... Byrne reminded us all there was a family at the heart of this team of adventurers. 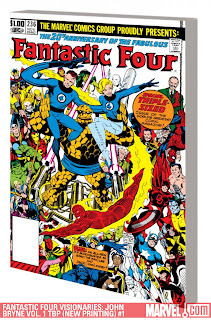 The Fantastic Four has always been called "The World's Greatest Comics Magazine." The evidence is found in these very pages. Collecting FANTASTIC FOUR #232-240. Scott Adams, not to be confused with the creator of the Dilbert cartoon, was the most widely recognized microcomputer programmer in the world and a pioneer in the development of adventure games for the PC in the late 70s and early 80s. The original concept developed by Scott Adams and John Byrne is rather straight forward. An alien race, which has known peace for many centuries, is confronted by an alien threat. Unable to defend themselves, one of their own devises an indirect method to defend themselves. An artificial construct referred to as the Chief Examiner makes its way to Earth and uses a mysterious portal to gather the energy of various heroes. There was also a rather curious subplot about sentient energy eggs and bio-gems and how they hoped to manipulate the power that the Chief Examiner was gathering. 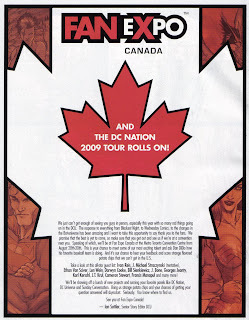 The fourth issue was published later in the pages of Marvel Fanfare #33. 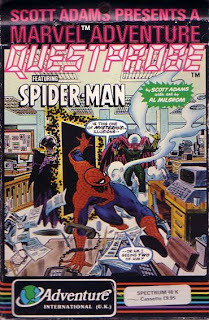 Each issue was a self-contained story involving a Marvel superhero and fed directly into the tie-in Questprobe computer game. Each issue was also done by a different creative team that actually had ties to that spotlighted characters. 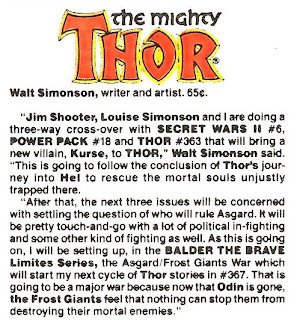 For example, at that time, Mantlo was writing the Incredible Hulk and Ron Wilson was drawing The Thing. Apparently, the story was finally wrapped up almost ten years later in Quasar, written by Mark Gruenwald. As for the actual computer game, it was one of those text adventure games (I played it on the Commodore 64). Playing it again, I can’t help but laugh at the fact that I was entertained by this type of a game. However, it doesn’t take long for the game to get really frustrating. You start off as Bruce Banner and are tied to a chair. No explanation. After multiple tries, I finally tip the chair over. This action gets Banner angry and he turns into the Hulk. Go right? Nope, gas pours into the room and turns you back into Banner. Sigh. Looking around, I find a metal ring on the floor, but I can’t lift it. I move east into a tunnel. I push a button on the wall and it tells me the “Delay is on”. I continue east and out of the dome only to be crushed by the high gravity outside. Grumble, grumble. Was there any wonder why so-called Adventure International went out of business?